2009 1oz. 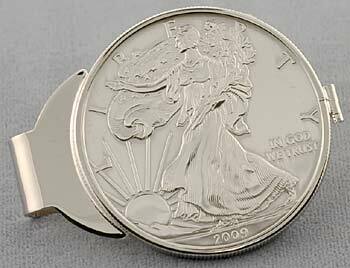 Silver Eagle, set into a sterling silver money clip. Comes in a Navy Blue Suede Display Gift Box (3 1/4"L x 2 1/2"W x 1 1/4"H). Makes a great gift this holiday season! 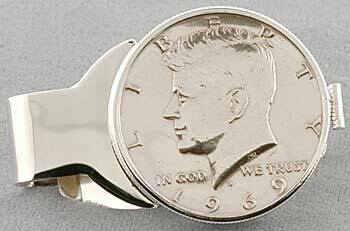 JFK Half Dollar, set into a sterling silver money clip. 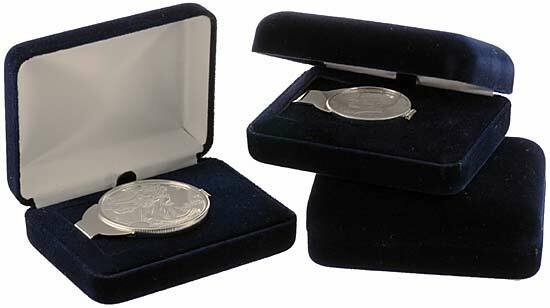 Comes in a Navy Blue Suede Display Gift Box (3 1/4"L x 2 1/2"W x 1 1/4"H).